From Ranveer entering on a Sea Plane to the Wedding Venue's exclusive pictures, here's the recent most updates on #deepveer Wedding! Ranveer Singh is the kind of boyfriend every girl dreams of, am I right or am I right? Well, if you are still thinking, here’s reminding you when he Facetimed Deepu when she won an award and the many times he has gone down on his knees on screen. *You get the drill right? * No? Then let’s these pictures to jog your memory! And, while I sit here and wish that I be followed with a rose everywhere I go too, let’s gear up for the Wedding Of The Year! It’s 2 days to go for #DeepVeer people and my excitement is literally reached to the roof! I don't even mean this metaphorically anymore! The love birds are all set to tie the knot at Villa del Balbianello, Lake Como on November 14 and 15. On 14th November, the duo will get married according to the Konkani traditions in which Deepika will don a traditional saree and on the next day i.e., the 15th November there will be an Anand Karaj which will take place for which Deepika is rumoured to be wearing a pink-purple lehenga. 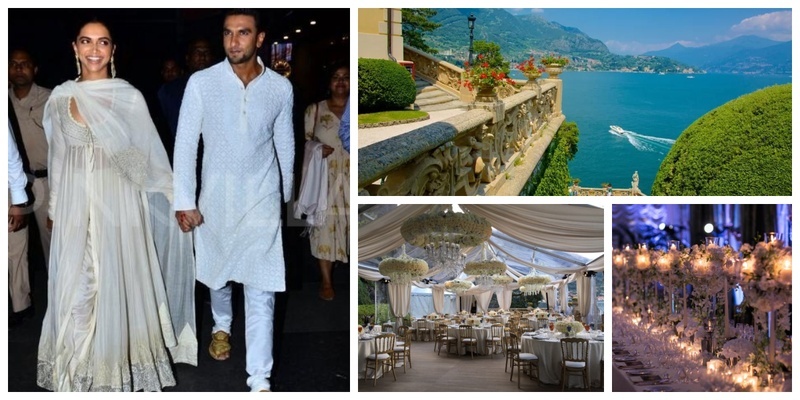 The exclusive report also adds "Ranveer has also chartered two luxury yachts for his guests to reach Villa del Balbianello where Deepika, her family, and guests will be waiting." The couple will be in colour coordinated outfits for the wedding festivities. The buzz has it that The Wedding Filmers will be covering Deepika Padukone and Ranveer Singh’s wedding ceremonies, while Vandana Mohan is their wedding planner! The couple has already left for Italy for the week-long festivities. Ranveer and Deepika will return to India on November 18, 2018. They will be hosting a wedding reception in Bengaluru on November 21, 2018 at The Leela and in Mumbai on November 28, 2018 at The Grand Hyatt. Well well, all the people at the #DeepVeer wedding, really up your Instagram game!